Got new chain cam Ingenium 2.0 litre engines from September 2015. Huge improvement over the old Freelander. Excellent roadholding and handling both on and off road. 5 Star Euro NCAP Safety Rating: 93% adult protection; 83% child protection; 69% pedestrian protection; 82% safety assist. 13-3-2018: New software update that gets rid of most of the Incontrol Touch Pro (entertainment system) gremlins. This update is for Discovery Sport, Evoque, Velar and F-Pace . It’s called 17c. Or 3.5. Released late February, so if anyone has trouble with the infotainment system, they need to shout at their dealer for the latest update. Interior build quality could be better, especially the B Pillars. Early (2015) Ford 2.2-litre SD4 engine has high running costs. Ride is firm at low speeds. Early (2017) production Land Rover Discovery Sport with the Igenium petrol engines cannot accommodate a spare wheel because of the configuration of the exhaust system. Happily, from 11th September 2017, the Reduced Section Spare Wheel (029NZ) becsme available to order for an Si4 240HP and 290HP Petrol engines. Driver's seats of Discovery Sport SE TECH do not have adjustable lumbar support. 17-6-2015: Complaint of new Discovery Sport inducing snake every time a truck is overtaken on the motorway. Did not happen with same caravan and previous Freelander II. Suggests fault with towbar fitting, towing electronics or tyres, especially if the ESC is not properly set for towing. 7-8-2015: HonestJohn.co.uk test car suffered from a loud engine vibration and seats that creaked as you tackled tight bends. 25-8-2015: Apparently DAB reception of BBC Radio 3 is poor and patchy. May be due to using the latest DAB system. Will still get BBC Radio 3 on FM. 7-9-2015: Was an issue with the second row seat folding mechanism that has lead to large mumbers of disignated LandRover Discovery Sports being quarantined before delivery (see Recalls). 7-9-2015: Latest issue with Land Rover Discovery Sports resulting in quarantine seems to be something to do with the EU6 Certification of the AdBlue SCR system for the Ingenium diesels in Discovery Sports. 23-10-2015: Dealer held back delivery of Discovery Sport because found a fault with the wiring loom during the pre-delivery inspection. Dealers words: "could cause a fire and wreck the engine". Maybe a one-off. 6-11-2015: Stop-start of three week old Discovery Sport auto with Ingenium diesel shut down engine at traffic lights, then shut down entire car. 2-12-2015: Another report of stop-start of same October 2015 Discovery Sport shutting down whole car. The gear knob disappears, all the lights go out, etc. Waiting for traffic lights to turn green on a hill in Drive with foot on the brake, when lights changed driver put my foot down on the accelerator to move off and instead the car rolled backwards. He went into neutral then back into drive while with his foot on the brake, then put his foot on the accelerator and again the car rolled backwards. He turned the engine off and back on again and all was ok. Eventually the Land Rover dealer relented and accepted rejection of the car. 18-12-2015: Report of several interior noises in 2015 Discovery Sport bought March 2015 2015, from leaving the showroom. The car has been back with the dealer 4 times and they now say they cannot get rid of the noises. Car now has 10k miles. 10-3-2016: Another reader (with 35 years of caravan towing experience) reported instability when towing with a 2015 Land Rover Discovery Sport. Same 4 year old caravan with which had no instability problems with previous car. 19-6-2016: Clarification of interior noises (18-12-2015). Originally the fault was tied down to a limited range of vehicles. However, the LBT00827 fix has now extended to 2015 onwards with no end in sight. Customers are buying band new cars and having to get invasive chiseling of B-Pillar and drilling out welds and rewelding to the car within weeks of purchase. 16-7-2016: Report of tailgate of brand new Discovery Sport failing to close properly and therefore won't lock. Dealer supposedly fixed it at delivery but keeps recurring. 2-9-2016: Complaint of severe vibration from Land Rover Discovery Sport diesel bought new in March 2016. Back to dealer 4 times total 11 days for vibrations from accelerator, steering column, drivers floorpan, Centre console and centre armrest. Both local dealer and supplying dealer tell owner that "It’s a characteristic of the new diesel engine. "LR Customer Relations refer owner back to dealer. See 9-6-2016. and 18-12-2015. 20-9-2016: Report of various problems with new Land Rover Discovery Sport purchased 22-7-2016. On driving home from dealership discovered that wheel arches were so badly fitted they were rubbing on the inside of the wheels. Temporary fix by the AA. Booked into dealer to be fixed on 11th August then on 10th August dealer cancelled the booking. rebooked for 30th August. 24th August load squeak from load area added to faults now poor fitting trim front wing to door, wheel arches, missing bolts in the rear bumper. Car returned on 30th August, now with a badly repaired scratch on the hatchback. Car returned to dealer again on 1-9-2016 for warranty cork to be completed and hatch lid repaired. Car returned 6th September with poor quality repairs. 16-9-2016 rattle from B pillar (see 19-6-2016). 1-12-2016: Latest on Land Rover Discovery Sport B-Pillar ticking/rattle is that one reader had rejected her second Discovery Sport for this fault. Technical bulletin for original 3-stage fix was LBT00827. This week, JLR released an updated fix for the issue. As well as the previous drilling out of existing welds and re-welding of the B-Pillar, they are now riveting the seat belt anchor points. 3-1-2017: Smoke from engine compartment of new Land Rover Discovery Sport purchased on 19/12/16 had to be recovered after less than 250 miles. Dealer told owner the car's turbo was faulty and needs replacing. Under the Consumer Rights Act 2015 he could, theoretically, reject the car. 25-1-2017: More on the Land Rover Discovery heater motor issue: Since reported on 10-1-2018 the car has been parked at the Didcot dealership along with 11 others, all with the same fault and all awaiting modified scuttles with no news as of today as to when they will all be fixed. Seems rainwater has been routed into the blower motor via the scuttles and shorts it out. Dealer reckons there must be a large number of 2017 Disco Sports in the same position across the country. 27-2-2017: Complaint of Land Rover Discovery Sport failing to respond to lifting off accelerator. Dealer agreed to a refund but only on the basis of 75p/mile for the 3,500 miles the car has done. 14-4-2017: Report that January 2016 Land Rover Discovery Sport with 2.0 Ingenium diesel engine went in for its first service in March 2017. During this the dealer detected an engine noise (of which the owner was unaware). Dealer said that he neaded to change the turbo. Dealer was not satisfied with the results and then persuaded LandRover to change the engine. 16-4-2017: Report that "poor" fuel economy of Land Rover Discovery Sport of 40mpg over its first 1,500 miles turned out to be due to a faulty engine management system that was replaced, resulting in a significant improvement in fuel economy. 17-4-2017: Land Rover Technical Bulletin LTB00827V6 received concerning fixed for the 'B' Pillar rattle and superceding all previous TSBs about this issue. Extracts include: "Using a suitable tool, strike the panel inwards over the highlighted area shown. The panel should be struck with as much force as can safely be applies. repeat along the highlighted area shown. This will eliminate the noise from this area." "Using a suitable hammer, insert the suitable chisel between the inner 'B' pillar and the cant rail, to a maximum depth of 20mm. This will eliminate the noise from this area." CAUTIONS "Make sure no damage is caused to the vehicle." 19-6-2017: Report of 2016 Land Rover Discovery Sport being rejected and replaced by LandRover dealer "due to a significant number of defects." The replacement also has significant problems, which the dealership accepts and has attempted to fix on two occasions and is still trying. Owner wants to reject the replacement also as it has been in the dealership for 6 weeks followed by 2 weeks back at Halewood. The dealership is offering a refund £5,854 less than what the owner originally paid in 2016. 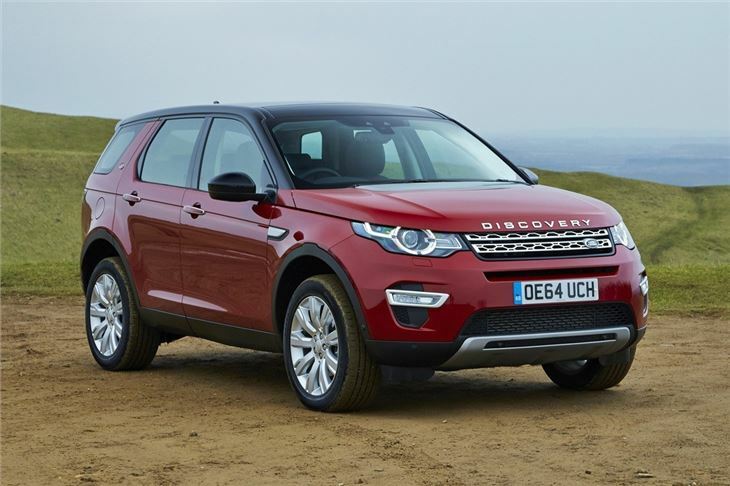 29-6-2017: At 5,000 miles, engine oil of Ingenium diesel engine of 2016 Land Rover Discovery Sport found to be contaminated by diesel 4.2% by volume from active regenerations of the DPF against a maximum permissible of 7%. Dealer re-set the service interval indicator under warranty from 8,350 additional miles to 19,850 additional miles and told owner in writing that he should stick to the standard intervals, i.e. the first oil service to be done at 21,000 miles total, or 2 years whichever came first. Also told him he should ignore the service interval mileage indicator and only take it for an oil change if the car requests one due to the diesel contamination rising towards maximum. They quoted £528.66 for a full service includeing an oil and filter change and would not carry out an oil and flter change alone. 24-7-2017: Report that side protection mouldings (a dealer fit) on Land Rover Discovery Sports are not compatible with the optional wade height sensors that then think the car is at its maximum wading depth even when standing on dry land. 11-9-2017: Report of repeated transmission trouble with December 2016 Land Rover Discovery Sport, purchased at four months old as an ex-demo. It has had three separate incidents of gearbox/selector fault, the last one involved seizing up whilst travelling at approx 30mph. 15-9-2017: According to a July 2017 Service Compliance Notification sent out by Jaguar Land Rover, 16MY and 17MY Discovery Sport (DS) and Range Rover Evoque 2.0L Ingenium Diesel vehicles (EU6b Market) are suffering from premature diesel dilution of the engine oil due to a "higher than expected" number of DPF regeneration cycles. The root cause of the problem lies in hardware and architecture issues ("differences") which were seemingly not addressed when the Ingenium engine was migrated from the Jaguar product line to the Land Rover SUV models. Consequently, DS and Evoque vehicles require a higher amount of post-injection activity in order to achieve the same carbon burn rate, compared to the similar 2.0L diesel when fitted in the XE and XF. A service indicator informs drivers that an interim oil service is required when oil dilution hits 6.1% and, based on owners' personal reports, this normally happens anywhere between 6,000 miles and 12,000 miles, against a nominal service interval of every 21,000 miles or 2 years. JLR is currently operating a "goodwill" campaign under which owners of Evoque and DS vehicles registered before 1st June 2017 will obtain the interim oil and filter changes free of charge, so long as the service indicator comes on before 15,750 miles from new, or since the last scheduled service. Web forum reports from DS and Evoque owners point to diesel dilution typically increasing at rates of between 0.5% and 1.0% per 1,000 miles extrapolated from service messages being displayed anywhere from 6000 to 12000 miles, depending on "driving style". 26-9-2017: Report of undefined rattle from September 2016 Land Rover Discovery Sport. " Within days of purchase we became aware of what sounded like an engine rattle, audible at 1,600 rpm when the engine was warm. The rattle was initially diagnosed (we now believe wrongly) as a dashboard rattle by another JLR dealer. When we returned it to the selling dealer for repair we stated clearly in writing that we were not waiving our right to reject the car in accordance with our rights under consumer law which we would invoke in the event of an unsuccessful attempt at repair.‎ The repair appeared to have been successful and we enjoyed eight months of rattle-free motoring. The noise then returned in May 2017. We contacted the selling dealer again and arranged for it to be repaired in August. This time we were advised that the rattle was a recognised problem with the model and that there was a manufacturer approved fix which they would execute. (COULD THIS BE THE B PILLAR RATTLE?) Once again, however, the repair was unsuccessful and the rattle returned loud and clear the day after the car was returned to us. Interaction with JLR throughout this unpleasant experience has been unproductive. Both they and the selling dealer sought to convince us at the outset that we should not reject the car. The car has now covered 15,000 miles. They want yet another opportunity to attempt repair and refuse to tell us what they will do for us if the third attempt is again unsuccessful." 27-9-2017: Report of owner taking 8 month old Land Rover Discovery Sport into the local dealer for an Ad Blue top up only to be informed that it needed a new engine. Apparently the balancer shaft had failed. The car is now with the dealer having a new engine put in. 30-9-2017: Owner put his finger on why his Land Rover Ingenium diesel is regenerating so often. His engine went into limp mode, he called out Land Rover Assistance, and on the machanic's diagnostic screen he read that the DPF was only 20% full of soot but the "Normal Trigger for Active DPF Regeneration" field said 36%. The interval between DPF regenerations was 203 Miles and 6:48 hours which seems very low for a car that generates the majority of its mileage on motorways and trunk roads. So he thinks that the problems with diesel dilution could be down to something as simple as a trigger for Active Regeneration that has been set too low. 25-10-2017: Report of 8 TSBs and recalls in total on a March 2016 LandRover Discovery Sport and now the ESR has failed requiring 8 days work to rectify. 29-10-2017: Report of annoying vibration in 2016 Land Rover Discover Sport HSE seeming to come from behind the steering column area. This only occurs after the vehicle has warmed up and done several miles, and is only there when accelerating. Car has been in to LR main dealer twice who say they can't find what causing it. Also the stop/start has stopped working. 31-10-2017: Clear explanation received from reader for the Discovery Sport and Evoque Ingenium sump oil contamination issue: "JLR has now admitted to me in writing that the DPF can never get hot enough to enable any passive regeneration to occur in "normal driving". The reason for this is that, unlike the XE/XF where the Ingenium engine is mounted in-line, on the DS and Evoque there's insufficient room between the engine and the bulkhead to fit the DPF. Therefore it had to be positioned horizontally 1 metre further back, downstream of the oxidation catalyst, a position where gas temperatures are too cold for passive regeneration to work at all - you can see the architecture very clearly on this video : https://www.youtube.com/watch?v=RnJMUuwbCCc / JLR engineers who came to investigate a fault with the EGR on my car said that this design problem explains the longer warm-up period for active regeneration of between 10 and 15 minutes before the HC/PM starts to burn. It then takes a further 15 to 20 minutes to complete the active regeneration giving a total time of up to 35 minutes for the whole process. So 35 minutes of post-injection every 150-200 miles is the real reason why the diesel is diluting so quickly on these vehicles and hence why the service schedule is shot to pieces. Now that this has all been confirmed and corroborated it becomes crystal clear that there is no hope of this problem ever being fixed properly - it is simply too expensive. To cap it all, in their letter JLR finally provided their customised definition of "typical driving style" - one that conveniently fits the performance limitations of the faulty DPF architecture: " 'Typical' driving style as an average across customers is journeys of 15-30 minutes with a speed between 50 km/h and 100 km/h, which includes some drives of over an hour. The exhaust temperature achieved in normal driving is low and as such there is no passive regeneration and soot must be cleared through active regeneration. " Jaguar Land Rover letter, dated 24 October 2017. Do you see why they need to include the bit about "some drives of an hour"? It's because the active regeneration (the only regen that actually works) can't complete within 30 minutes. The effects of the problem, which was originally described by the Service Compliance Notification JLRP00100, can now be fully explained in all its technical detail: it is caused by a design error, plain and simple. Once I had put all the pieces of this together I rejected my car without a moment's hesitation as faulty and not as described and I think that there will be many more doing the same before too long." 2-11-2017: JLR's response to the above: Introduction of the Diesel Particulate Filter (DPF) for Euro stage 5 emissions regulations (European legislation governing diesels) vehicles and onwards is a method of minimising diesel particulate output which is a bi-product of combustion. Vehicle manufacturers employ the use of DPFs in diesel vehicles. This is an industry-wide technology and not limited to Land Rover vehicles. There is no design issue with the Range Rover Evoque or Discovery Sport. All Land Rovers feature intelligent engine management systems that inform owners when an action is required to protect the engine ensuring a long life.The owner handbook explains DPF cleaning as follows:- Cleaning of the exhaust filter, also known as regeneration, occurs automatically, approximately every 180 to 560 miles (300 to 900 km) depending on driving conditions, and requires the engine to reach normal operating temperature. The self-cleaning takes place when the vehicle is driven steadily at speeds between 40 mph to 70 mph (60 km/h to 112 km/h). This process normally takes 10-20 minutes. It is possible for self-cleaning to occur at lower vehicle speeds, but the process may take a little longer at a 30 mph (50 km/h) average speed. Some driving conditions, e.g., frequently driving short distances, in slow-moving traffic, or in cold weather may not provide sufficient opportunity to begin the exhaust filter self-cleaning automatically. When this occurs, a warning icon is displayed in the message centre. For an Amber warning: Exhaust filter self-cleaning is required. Driving above 40 mph (60 km/h) for 20 minutes should clean the filter. Land Rover vehicles are fit for purpose and have been engineered to the highest standards. Should any customer have any questions, they are invited to contact us on 0370 500 0500. 5-11-2017: Report of February 2017 Land Rover Discovery Sport Ingenium diesel needing a first oil change at 10,000 miles, with JLR providing oils and filters FoC. F uel consumption just about reaches 30 mpg and it seems to drink Adblue. 6-11-2017: Report of failure of heating/aircon/ventilation system of Land Rover Discovery Sport, reported to dealer on 24th October. Earliest date available for repait given as December 18. Owner emailed Land Rover customer services for advice. Received automated reply stating will reply in 3 working days. To date (November 6) still no response from Land Rover. 5-12-2017: Report of DPF regeneration problems with 2017 Land Rover Discovery Sport with Ingenium diesel engine, leased to cover a mere 9000 miles a year. Currently needs the DPF filter fixing for the third time at £1350 cost to the lessee. Neither Land Rover or the lessor will do anything about his predicament. At no stage prior to taking out the lease was he told 9k wasn't enough mileage, neither was he informed prior to leasing about the possibility of issues with DPF filters. (He had never even heard of them prior to this.) Land Rover says he needs to travel further and faster, as he's not getting the engine hot enough. He is told if the warning light comes on he needs to do another 20 miles at over 40mph, immediately, which he regards as neither practical, nor fair. 17-12-2017: Complaint about Land Rover Discovery Sport with Ingenium diesel engine needing to go to the dealer for a free refill of AdBlue every 4,000 miles. Also only doing 27mpg. Owner received explanation about active regeneration from JLR as follows: "As confirmed on the telephone the 'contaminant' (in the lubrication oil) is diesel fuel. As part of the regen process, diesel is injected into the combustion chamber (post burn) so that it burns later in the exhaust - thereby regenerating the DPF. If the engine is switched off before the regen cycle is complete, any diesel fuel left in the combustion chamber will leak past the piston rings/seals into the engine sump, diluting the oil. When the dilution reaches a predetermined level, the warning light is displayed, indicating that an engine oil and filter change is required (the frequency of this is very much dependant on customer drive cycle)." 19-12-2017: Another report of rattles, this time in a January 2017 Discovery Sport HSE, first noticed in September 2017 when rattling noises started coming from both front doors and around the glove box, getting progressively worse. Returned to supplying dealer who was unable to rectify the problem, so on the 5th December it was booked into their body shop. On 19th December and the problem has still not been completely resolved. Owner loaned twqo discovery Sports in the meantime, bioth of which has similar rattles. Dealer told owner, "It has been identified there is a problem with Discovery Sports." 22-12-2017: Complaint that new Land Rover Discover Sport Si4 240HP petrol 9 speed automatic is hesitant and jerky. We thought it might be the fuel used and recommended switching to Super. 2-1-2018: LandRover Service Action SSM73697 issued. ﻿This identifies a fault with the DPF active regeneration system of some Imgenium diesel engines fitted to S=Discovery Sports. 10-1-2018: Report of heater motor of Land Rover Discovery Sport failing due to water ingress and a shortage of parts (including modified ducting) to replace it. Apparently, LR issued a warning that there was a problem with the scuttle design and that a modified version is will be provided as a free problem fix. Delivery of same is weeks or more away, so a number of Discovery Sport are sitting at dealers waiting for parts. 15-1-2018: Complaint of poor fuel economy of new Land Rover Discovery Sport SE Tech 7-seater only averaging 33mpg v/s NEDC 53mpg. Also " every few hundred miles the DPF gets clogged up necessitating a pointless journey to clear it." 23-1-2018: Complaint of problems with DPF of Discovery Sport diesel bought December 2017: "I bought a Disco sport 150bhp 2WD one month ago. The DPF light has come on 3 times now. The 1st time after 250miles of London Driving. Regenerated it on a motorway drive at Xmas. On returning to London, within 100miles of in-town driving, on again at yellow, then to red within 2 days <20miles. Needed to take back to LandRover for a forced regeneration. Got it back 6 days ago and after 80miles of London driving (short hops all <5miles) the light is on again." See: 2-1-2018: SSM73697 "A quality concern has been identified with the Selective Catalyst Reduction (SCR) catalytic converter and it does not align to the calibration management software for this system and therefore does not manage the soot levels as required." 2-2-2018: 2017 Land Rover Discovery Sport called in for Ingenium diesel engine balancer shafts to be replaced at 9,300 miles. JLR would not advise why, but owner noticed an unusual noise. Owner has found that in other cases the entire engine has been replaced. Speculation on LandRover Discover 3 forum that possibly the DPF oil contamination issue is affecting the balancer shafts. See Recalls 19-1-2018. 14-2-2018: Series of issues reported with November 2016 Land Rover Discovery Sport HSE Black reported. To date it has been in the Dealership for a cumulative total of 16 weeks. Amongst the faults have been: Reversing camera failure plus associated electronics - 7 weeks; Rear tailgate hydraulics failure; Rear brakes (Calipers, discs and pads) replaced 3 times, latest episode has been 6 weeks in Dealership; Heater failure; Rear light condensation and had to be replaced; A number of software updates, a couple of which caused further problems requiring further resolution; The rear door was also damaged on one visit requiring a re-spray. 23-3-2018: Report of Land Rover Discovery Sport Ingenim diesel 7-seater, taken delivery 30th March 2018, almost immediately running into problems: Owner left it parked for two weeks as still had company car. Started to use it 13 April when drove to Leicester then on to Norwich, then Buckinghamshire days after, which means it had a good run,. On 26 April, "engine warning light" came, followed by an amber restricted performance with intruction to run it for 20mins at 40+miles. Owner could not do that right there and then, but the next day the "restricted performance" turned red and the drive became very sluggish. Owner immediately called JLR customer assistance and which sent a JLR crew. owner was given a report with several codes including P0229 which is about the DPF., turbo, etc. OwnerI was sent to nearest JLR service ctr/dealer (but not dealer from which car was purchased, as was further away). At that point called our sales agent to inform him of the incident and verbally expressed loss of confidence in the car. But went through the servicing process. After 2 weeks, got car back. On 11 June, engine symbol came up again (after having a drive to Oxford just a week before and Alton Towers the day before that, so it had a good drive to activate DPF regeneration). Had not gone far, then the amber "restricted performance" came up. Parked the car, urned it on again and red restricted light came on. Oswner had to call JLR customer assist who asked if could wait for a JLR crew to come around 11am the next day, to which owner said could not wait. So at 11:30pm an AA crew was sent. He then gave his report, which again mentioned, P0229 amongst others. Owner immediately got in touch with Sales agent who said he would talk to their service manager. Also advised in-house finance team that partly owns the car too. Copy furnished the Finance team with all reports and correspondences. They say they will be conducting their investigation, and it usually takes 56 days before they get to a solution. Saga then went on and on and started to get legal. 24-3-2018: Transpires that the DPF active regeneration system on some Land Rover Discovery Sports fitted with Ingenium diesels is not operating correctly. One system was replaced FoC when the amber light only came on for 2.1 seconds, directly followed by the red, not giving the driver sufficient time to complete the required drive cycle to regenerate the system. See Service Action 2-1-2018. 30-3-2018: Report of April 2017 Land Rover Discovery Sport Ingenium diesel needing an engine oil and filter change every 3,300 miles due to oil dilution. Scheduled oil changes remain 21,000 miles (which is ridiculous). Owner being asked to fork out £240 per oil and filter change. Told his driving style is at fault. 13-4-2018: Report of new Land Rover Discovery Sport diesel DPF "clogging up every 200 miles or so." 17-4-2018: Finally, JLR came up with a fix for the Discovery Sport B-Pillar complaint: "Having investigated a number of vehicles that exhibited the noise, we determined that there were several factors that contributed to multiple noise sources (although they sounded like a single tick in most cases). In addition to the changes made to the welds on the seat-belt reinforcement panels, we made very subtle changes to the press tools to make slight dimensional changes to a number of panels. Additionally, we re-positioned a number of welds and we extended and tuned the sealer path which changed the characteristics of the paint flow. We developed specialised, additional end-of-line testing which allowed us to find issues in plant and we put a large number of vehicles through this test without a failure before we were confident that we could release the Assured VINs. As it is understood that the noise tends to manifest itself at higher temperatures, we also put cars through our hot test chamber on a continuous basis and completed the hot climate testing on more than 300 cars before we released the Assured VINs. Finally, we have a number of markets where the higher temperatures and more arduous road conditions resulted in a much higher failure rate than in other territories. There have been no noises on cars past the Assured VINs in these territories." 24-4-2018: Report of 18 month old Land Rover Discovery Sport with 8,500 miles coveredm mainly short journeys, already needing a second oil and filter change due to sump oil contamination with diesel. 25-5-2018: Report that handover of all new Land Rover Discovery Sport Ingenium petrol and diesel models has been held up since 11th May 2018 due to an issue concerning ‘Incorrectly assembled oil pump’, which could result in oil pump failure. Technically it is Disco Sports with VINs in the range 748576 to 771222. Document Ref: N212 UPS5718 version 1 issued on 11-May-18 - version 2 was issued 21-5-2018 (the only change is to give a later maxium end date before another announcement i.e. before 11-Jun-18). 18-6-2018: Reports of faults with 2016 Land Rover Discovery Sport have included: 1: Leaking Tailgate; 2: Service warning light error; 3: Climate control failed; 4: StopStart Erratic; 5: Engine management light on; 6: Failed to calibrate camera after windscreen replacement; 7: Rear passenger seat rattle; 8: Hazard warning light not illuminated; 9: AEB failed to initialise; 10: Rattles from rear of the vehicle; 11: Tailgate misalignment; 11: Interference on media screen. The last fault occurred after owner got car back from dealer fixing the tailgate. Car teturend. Dealer emailed stating technician had replaced the rear view camera and had run various diagnostic tests but still could not find the cause of the interference. Had also been advised by LR technical that as car had an non OEM audio system installed, this had to be removed before any further work was done. They have also put a hold on the 2 yr warranty. Owner took car to installer of audio system who quickly diagnosed and corrected the fault, which was a poor earth lead attached to the tailgate that the dealer's tech had not found. 20-6-2018: Owner of 2016 Land Rover Discovery Sport reported dashboard notice that brake pads were worn at 15,000 miles. Rear discs and pads replaced under warranty because this was a known fault because of the now resourced aggressive rear pads causing premature wear of the discs. The front discs were only worn 10%. 25-6-2018: Report of clutch failure of LandRover Discovery Sport at 37,000 miles. Independent garage that replaced it also found that front brake pads were worn beyound the limit. Because car had recently been serviced at a LandRover dealer and this had not been spotted by the fitter, the dealer replaced the brake pads FoC. A few weeks late the engine management warning illuminated followed by a red "Performance Degraded" indication. Local garage mechanic quickly discovered that during the dealer service the Turbo pipe had been incorrectly fitted and become detached. 9-7-2018: Report of December 2016 Land Rover Discovery Sport Ingenium diesel 150HP regularly driven long distances, requiring its first indicated oil change at 12,000 miles; its second at 21,500 miles and now its third at 27,000 miles, indicating premature oil contamination. Owner never switches off engine from hot running and normally averaged 44.5mpg. 30-7-2018: Complaint that SatNav of 2016 LandRover Discovery Sport is very poor in both accuracy and flexibility. Owner tried using a separate SatNav but couldn't get a signal, presumably because of the heated windscreen screening the signal. 23-8-2018: Report of April 2018 LandRover Discovery Sport 2.0 diesel consuming 15 litres of AdBlue in 6,000 miles of avarage use including long, short, motorway, local road journeys and now requesting an oil change. Owner has seen the service compliance notification issued by JLR to dealers giving a directive to provide discretionary oil services in the event that customers complain about the poor service intervals. Owner ahs understood the problem is the result of the DPF failing to passively regenerate and therefore require more frequent active regenerations, but was not aware of the need to keep the engine running if she stopped at the end of a journey and was aware of heat under the car. 25-8-2018: Report of leased January 2018 Land Rover Discovery Sport having been repaired twice already and off the road for 7 weeks so far. The DPF filter warning light has just gone red again asking lessee to go to dealer. There has been no amber warning. 6-9-2018: Report of electrical problems since new in a LandRover Discover Sport purchased in November 2016. The supplying dealer replaced the information unit mother board earlier this year and updated the software. Owner had another software update recently, but info system still continues to randomly turn itself off. After a short time it goes through a reboot process and then turns it self back on. Supplier blames Landrover for providing faulty software, but the liability remains with the supplier. 10-10-2018: Problems reported with EGR cooler of December 2016 LandRover Discovery Sport with Ingenium diesel engine at 17,500 miles. Since May 2018 the car has been back to the dealer four times because of problems with the exhaust emmissions sensors. The volumetric sensor has been replaced and an EGR cooler has been replaced three times. 19-10-2018: At 15.00 hours on Friday 19th October 2018, JLR CRC has published a response on the Discovery Sport forum: "Thank you for your comment. I can confirm that Land Rover are currently working on a software enhancement in regards to the concerns that have been raised. Unfortunately at this time, we have not been provided with an update as to when this will be released. Once I have received further information I will arrange for the details to be posted in this forum. I apologise for any inconvenience that this may cause. Thanks, Becci"
3-12-2018: Reader very disappointed with new Discovery Sport bought to replace a Discovery 4. " The sat nav has a dreadful ‘voice’ which prefaces every instruction with a deadpan ‘please’ followed by the almost back to front directions. The audio system does not have a CD player, and we have had to learn to load and use a memory stick instead. Visibility is not nearly as good as the other car. The seats are not nearly as comfortable, or manoeuvrable; the rear seats aren’t heated and I dislike the auto stop/start. In fact I can’t think of anything in it I like. In addition, we discovered AFTER we had bought it that because it would have been over £40,000 new there is an additional £310 tax to pay each year for the first 4 years." 6-12-2018: Report of "dangerous" hesitation from engine/transmission of May 2018 Land Rover Discvery Sport with 240PS Ingenium diesel engine. Confirmed by independent inspection report produced as a court document. "For example – approach a roundabout, slow down, see a gap and go for it, the car just coasts into the middle of the roundabout and will not accelerate. By this time the gap has closed very fast and you have a car just about to enter the drivers door. Frightening. Horrible. Now put that type of situation into the everyday driving of the vehicle, slow down, accelerate round a corner (but it does not accelerate) and it is a very jerky driving style that emerges." Owner complained toLandRover and returned the car to the supplying dealer 5 times. Dealer told him "there is no fault it is a Design Characteristic of the car and you just have to lump it." They told him that "it is just a characteristic of all these cars and there is nothing they can do. 17-12-2018: Three reports of steering system failures on Discover Sport forum between Octobber and December 2018: https://www.discosportforums.co.uk/viewtopic.php?f=11&t=9490&p=100255#p100255/ 31st October snapped bolt on 2015/65 Disco Sport at 23k miles caused loss of steering on motorway; Also in October 2018 the steering rack of a 2015 Disco Sport detached from the car at 39,600 miles (though out of warranty LandRover picked up the repair bill of £2,500); Further report of steering rack of 2015 detaching during low speed manoeuvres in December 2018. Yet another on 17-12-2018, this time two failures; first repaired under warranty then failed again 8 months later. THis was also a 2015 Disco Sport so the problem seems to be confined to 2015 cars. 18-12-2018: Report of considerable steering wheel vibration in 2016 LandRover Discovery Sport at 11,000 miles when car is stationary and engine is idling. 24-12-2018: Report of LandRover Discovery Sport diesel requiring a fill of AdBkue every 4,000 mies rather than the advertises 11,600 mies. 26-12-2018: Report of repeatedly restricted performance from 2015 LandRover Discovery Sport diesel. 14-2-2019: Report of corroded rear silencer boxes on 2016 LandRover Discovery Sport, replaced under warranty. But owner has now noticed severe surface rusing of the rear subframe that the dealer has refused to rectify under warranty. 9-3-2019: Report on https://www.discosportforums.co.uk/ of TSB software update N289 recently being released for 2017 and 2018 MY vehicles. Apparently this re-sets the service indicator to allow for an engine oil dilution of 10%. Previously, the maximum allowable dilution was 6%. Owner reported that " At the moment my car needs an oil service about every 7,000 miles so theoretically raising the dilution trigger would give me another 4,000 miles or so, but at the end of that time the oil could be nine parts oil and one part diesel." 13-3-2019: Report by Land Rover dealer of rear brake discs of March 2015 Land Rover Discovery Sport 2.2 SD4 (190ps) 4 x 4 auto pitted with corrosion at 4 years old (though not so badly to have failed its independently carried out MoT). 15-3-2019: Important. See Recalls 15-3-2019. 19-3-2019: Report of whining noise first heard in September 2017 from engine of March 2017 Land Rover Dscovery Sport. Landrover Assist announced it was the balancer shafts and booked it in to the dealer for inspection and repair. A week or so later owner was told it needed a new engine. This was subsequently changed to a new set of balancer shafts. It took 6 weeks as the dealer had to ask for the assistance of JLR to replace them as no one at the dealer had done the job before. All done under warranty. In February 2019 owner began hearing whining noises and other engine noises again, but not all the time. Car went in for its first service (at 2 years and 17,500 miles) and the service engineers reported there were balancer shaft problems, plus a worn brake pipe that had come loose and was rubbing against the wheel. The brake pipe was replaced after a day or two. Initially, the service manager reported to owner that the engine will need to be replaced. A few days later said no. JLR's protocol is to change the shafts because a faulty batch had been installed during manufacture and replacing them was the response. Owner reminded him this is the second time, so were the first balancer shfts also replaced with faulty ones? 14-4-2019: Report of "chirrup" on starting LanfRover Discovery Sport. Dealer changed aux belt and tensioner twice to no effect. Might be a misaligned alternator. Might be the alternator itself. 10-11-2014 R/2014/091 for the Range Rover and Range Rover Sport on 10-11-2014 involving 1331 vehicles because "An internal fault can create a short circuit within the fan control module which may lead to overheating of the insulation and ultimately fire within the engine bay. This may happen with the engine switched off and possibly when the vehicle is unattended." Fix: Replace electric cooling fan assembly on affected vehicles. VINs: SALWA2PF1EA000001 to SALWA2PE9EA000061. Build dates: 09-03-2012 to 22-01-2013. 13-3-2015: Issue with 2nd row seatback electric release that first arouse 13/03/2015 and continued into June 2015 Action No. : Q477 UPS 34151. A potential concern has been identified whereby the boot actuated second row seat back electrical release system may not correctly operate. 14-9-2016: Voluntary Safety recall for Range Rover Evoque 2016 Model Year and Land Rover Discovery Sport 2016 Model Year. Engine cover to fuel line foul. "Your Land Rover authorised repairer will ensure the securing washers are pushed fully home and remove 9mm from the plastic moulded retaining posts. In addition, the tape wrapped around the fuel hose protective sleeve and the fuel hose will be visually inspected and replaced if there are signs of damage." 12-4-2017: Land Rover Technical Bulletin LTB00827V6 superceded all previous TSBs to fix "Ticking Noise" from the 'B' pillar area. 28-4-2017: Land Rover Safety Related Recall PO96 issued. "Land Rover Discovery Sport and Range Rover Evoque 2016 model year Diesel Engine Specification Vehicles - AJ200 Diesel Engine Harness Foul to Umbilical Bracket. A concern has been identified with the routing of the engine harness in that it may not provide sufficient clearance and as a result could contact the Exhaust Gas Recirculation Valve (EGR) umbilical bracket fitted to the vehicles identified above. Vehicles included in Safety Recall PO75 (R/2016/289) have received a modification which has subsequently been determined is not durable for the life of the vehicle. As a result, engine harness contact with the EGR Umbilical Bracket can cause the wires within the engine harness protective sleeve to wear through, exposing the actual wires to short to the metal bracket added as part of the Recall PO75 (R/2016/289) repair. There is a possibility that any circuit within the engine harness could be compromised dur tp this condition resulting in a range of vehicle failure modes. Jaguar Land Rover engineers have identified that in the worst case it is possible that the vehicle engine may cut out whilst in motion. Should the engine cut out the brake vacuum reeervoir will be depleted and the brakes will lose power assistance, however foundation brakes continue to operate." 22-05-2017: R/2017/145: for the Range Rover Sport and the Discovery 2-litre diesel on 22-05-2017 involving 692 vehicles because "The fuel return hose may leak. Increased fuel odour may be noticed and drivers may also observe liquid fuel puddles underneath the vehicle. It is possible that fuel may leak onto the road surface, which can present a skid hazard to other road users increasing the risk of a crash. Should leaking fuel come into contact with a sufficiently hot surface in the engine bay there will be an increased risk of fire." Fix: Recall the vehicles that are likely to be affected and replace the fuel return hose. VINs: SALWA2FN5HA142204 to SALWA2FNXHA148127. Build dates: 15-02-2017 to 30-03-2017. 2-1-2018: SSM73697 "A quality concern has been identified with the Selective Catalyst Reduction (SCR) catalytic converter and it does not align to the calibration management software for this system and therefore does not manage the soot levels as required." 19-1-2018: LandRover Service Action N128 announced concerning balancer shaft whine. 15-3-2019: 44,000 JLR cars fitted with Ingenium 2.0 litre diesel engines recalled because CO2 emissions can vary and exceed the required limits. Affects Jaguar E-Pace, F-Pace, XE and XF, as well as the Land Rover Discovery, Discovery Sport, Range Rover Sport, Evoque and Velar, models from between 2016 and 2018. Issue discovered by the UK VCA (Vehicle Certification Agency). "Certain vehicles fitted with 2.0L diesel engines may emit excessive levels of CO2 and may not conform with the certified condition. The product does not comply with the regulation setting emission performance standards for new passenger cars and the regulation on type approval of motor vehicles with respect to emissions from light passenger and commercial vehicles." Owners will be contacted by letter.